Yavapai Point has excellent views but limited parking and officially, vehicles over 22 feet are not permitted. 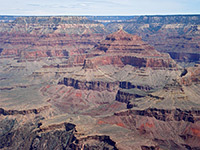 It is an easy walk west from Mather Point, and like Mather has a visitor center nearby - the Yavapai Observation Station, which sells books and displays information about the geology & history of the Grand Canyon. Yavapai provides perhaps the best panorama of the three points on this part of the south rim as it is the most northerly, and the closest to the Colorado River, allowing for unobstructed views up and down the gorge. 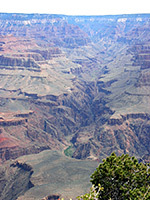 The river is just visible due north, at the end of Pipe Creek, immediately west of which is Plateau Point, reached by a branch of the Bright Angel Trail. In the other direction, the near ground is dominated by a long thin ridge running from Yaki Point, extending two thirds of the way to the river. Above and in the distance, peaks and points all the way to Desert View and Palisades of the Desert can be seen. 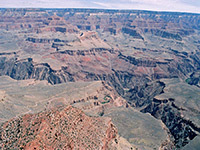 Three large canyons meet the Colorado on the North Rim. In the west, Trinity Creek flows from beneath Shiva Temple and joins the river near Hopi Point. Directly opposite Yavapai Point is Bright Angel Canyon, a long, straight drainage that provides the only maintained rim to river route on the north side of the Colorado. A few miles further east, Clear Creek forms a deep, twisting canyon that extends a long way northwards towards the distant Walhalla Plateau, above Cape Royal.